How many days between dates? The day counter, otherwise known as a date to date calculator, is a handy tool that lets you estimate the number of days between dates quickly and without any hassle. For example, you can use it when counting down to your birthday, or when you're wondering how many days are left before a critical deadline. That's not all, though! You can also use this date duration calculator to check what date will it be after a certain number of days will have elapsed - for instance, when you're starting a 90-Day Fitness Challenge, to find out when the challenge will end. Unknown number of days between dates. If you know the starting and the ending date (for example, of the summer holidays), you can quickly count the days between them. All you need to do is input the two dates into the day counter. Remember that the end date should be after the starting date - after all, you can't go back in time! Unknown start date. To find out what date it was 57 days ago, input the end date and the number of days elapsed into their respective fields. Unknown end date. You can also use this calculator to find out what day will it be after a specific amount of time has elapsed. To do that, input the starting date and the number of days between into the day counter. Imagine that you have a complicated project due at work. Today is July 14. Your boss wants to check the progress 14 days before the end of the project. Additionally, he expects the project to be finished by September 27. On what date will the progress check take place? How many days do you have before the progress check? To answer the first question, we need to subtract 14 days from the date of September 27. 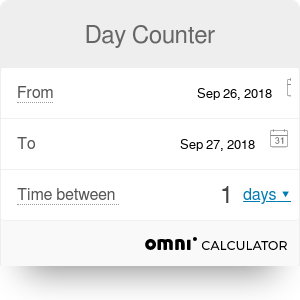 If you input 14 days as the days between, and September 27 as the end date into the day counter, you will quickly discover that the progress check will take place on September 13. Now that we know when the progress check will happen, we can calculate the number of days between dates of July 14 (the start date) and September 13 (the end date.) The result is 61 days - that's the amount of time you have left to work on your project. Not sure whether the result is correct? Go ahead and check it with the date duration calculator! Day Counter can be embedded on your website to enrich the content you wrote and make it easier for your visitors to understand your message.